MSM with vitamin C which supports normal collagen formation for healthy bones and joints. 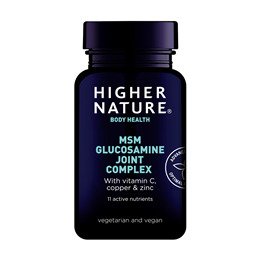 New, smaller tablets making them easier to swallow and with zinc which supports normal bones and copper that in turn supports normal connective tissue. Also contains added celery seed, nettle, ginger, ginseng and kelp. Now with 25mg of ginger extract, which is equivalent to 500mg of ginger root. MSM or methyl sulphonyl methane, is a sulphur compound that occurs naturally in our bodies and in our most common foods. Sulphur is found in all body cells, and in many amino acids, vitamins, enzymes and hormones essential for our health. Methyl sulphonyl methane, bulking agent: microcrystalline cellulose; natural lithothamnion calcarea, glucosamine HCl, ascorbic acid, anti-caking agent: magnesium stearate; ginger rhizome extract powder, nettle leaf extract powder, zinc citrate, anti-caking agent: silicon dioxide; coating: hydroxypropyl methylcellulose (glycerine); celery seed extract powder, natural kelp†, sodium borate, panax ginseng extract powder, copper citrate. †May contain naturally occurring fish and crustacea. Take 1-4 tablets a day, with meals, building gradually or as your healthcare professional advises. Not advisable if pregnant or taking warfarin. In some cases MSM may have a laxative effect. This is normal and should stop within a few days. This is normal, drink water and reduce intake if symptoms persist. 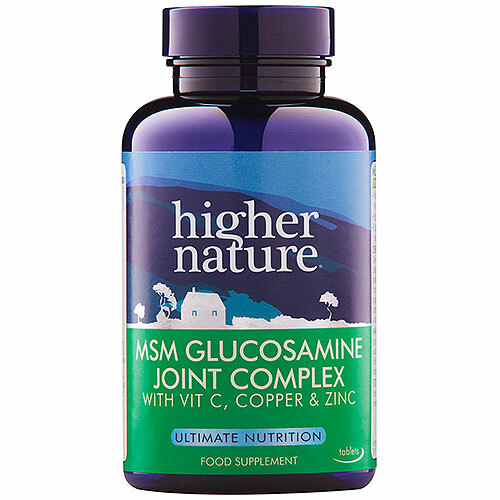 Below are reviews of MSM Glucosamine Joint Complex - 90 Tablets by bodykind customers. If you have tried this product we'd love to hear what you think so please leave a review. Seems to improve the amount of bend in finger joints before discomfort or pain. Only been taking for one month so it’s still a bit early. I intend to take for 3 months to see if the current progress can be maintained, hence only four stars at the moment. MSM with vitamin C which supports normal collagen formation for healthy bones and joints.